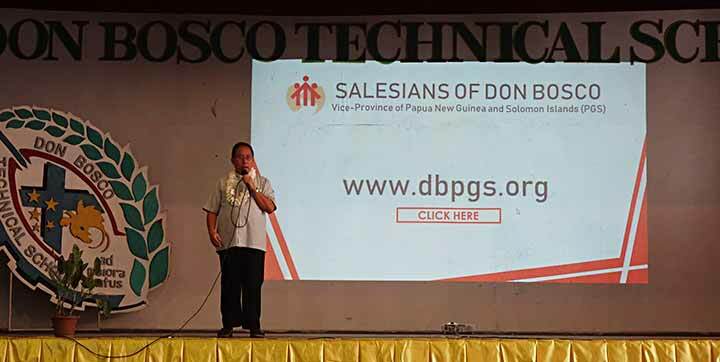 Port Moresby, PNG -- On 8 November 2018, Don Bosco Technical School, Gabutu, Port Moresby, had the privilege of hosting the launching of the website of the PGS (Papua New Guinea and Solomon Islands) Vice Province of the Salesians of Don Bosco. The whole Educative pastoral Community was gathered at the Kurongku Hall for this event. The launching was graced by the presence of the Provincial Superior, Fr. Alfred Maravilla SDB, and all the Rectors of the different Salesian houses in Papua New Guinea and Solomon Islands. 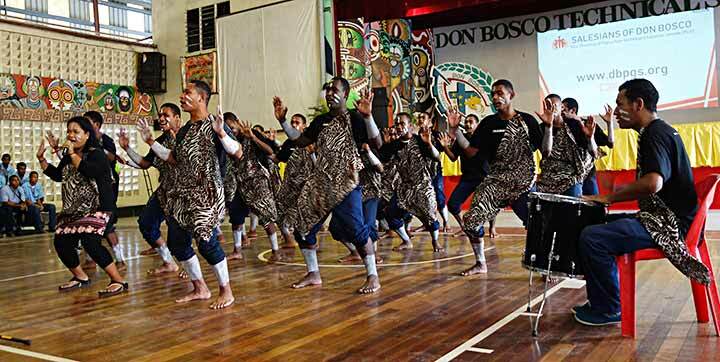 The Salesians were welcomed with an African song and dance “Bonse Aba” performed by the Mission Group of DBTS and their animator Ms. Rica Lavilla. Fr. Angel Sanchez SDB delivered his welcome address emphasising that Don Bosco himself was a “media man” who wrote and pub-lished books and pamphlets and a magazine, the “Salesian Bulletin” which since 1877 until now is still in circulation. Each of the Rectors, some of them also members of the Provincial Council, were introduced and warmly welcomed by the EPC of DBTS. Fr Alfred Maravilla stressed that the PGS Website “must be understood within the context of the mission of Don Bosco. The Salesians must be found not only in the five known continents in the world. 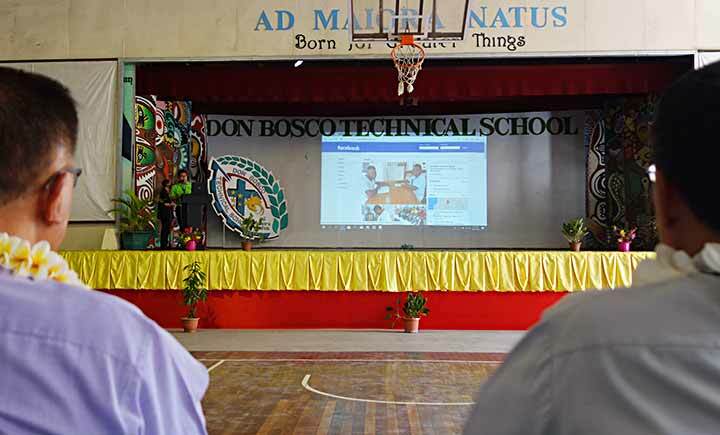 Now, they will also be visible in the ‘digital continent.’” He also said that the website does not only belong to the Salesians but to all those connected to the mission of Don Bosco in the Vice Province. He pointed out that it is an important tool to spread the Good News, and to make known the good things Don Bosco is doing in Papua New Guinea and Solomon Islands. The Provincial Superior also appealed to the staff and students to make a positive contribution to the website by writing articles, news, and stories, and sending good photos of what is happening in the different Salesian houses in PNG and SI and forward them to Fr. Ambrose Pereira SDB, the Delegate for Social Communication. Fr Srimal Priyanga SDB was acknowledged and thanked for being the person behind the creation of the website. After he delivered his message, the Provincial officially clicked the button opening the portal of the PGS Website www.dbpgs.org. Then Mr. Ian Zuasula, the IT Department Head of DBTS gave an orientation of the features of the website, explaining briefly the different sections. The section “Become A Salesian” particularly caught the attention of the students and teachers as it featured a video clip of the different Salesian houses in PNG-SI, the apostolate of the Salesians in the two countries, and the various stages of formation of the candidates to Salesian life. The program concluded with another dance number by a group of DBTS students. The Provincial and the Rectors went for a short break and then continued with their Meeting at the Bl. Peter ToRot Function Room.